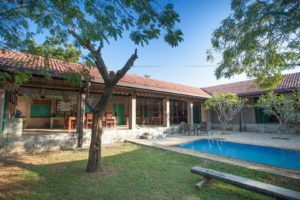 This appealing lodge, designed by Sri Lankan architect Channa Daswatte, has a simple open-plan design consisting of two long verandahs with half walls opening out to the central garden and swimming pool. One verandah houses the living and dining areas and the other has the sleeping accommodation. Interiors have polished cement floors and walls in soothing colours of sandstone and sea green highlighted with dramatic black and white images of Yala’s wildlife photographed by the Sri Lankan owner himself. 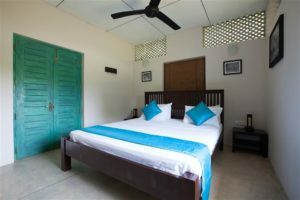 Yala Villa is ideal for families or friends travelling together. Up to 14 guests can be accommodated here. 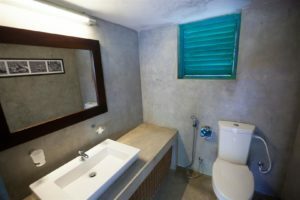 Yala Villa has one a/c ensuite bedroom furnished with a king size bed fitted with mosquito netting. This bedroom opens out to the living/dining verandah. 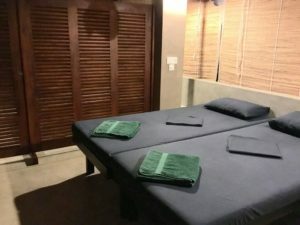 Typical of Sri Lankan lodges, there is also a more communal, dormitory-style area with beds for four guests and slightly more private cabin type accommodation for four more in the open-sided verandah furnished with single beds fitted with mosquito netting. 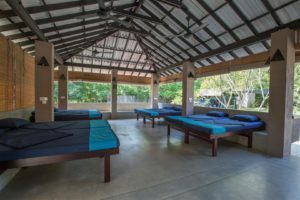 Sleeping arrangements in the verandah are basic, but allows guests to be closer to nature. Those wanting more comforts and relative privacy should opt for the a/c bedroom. There is a bathroom in the verandah with two w/c, twin vanities and separate h/w showers that can be shared by all. Overhead ceiling fans help to keep the verandahs cool and airy. 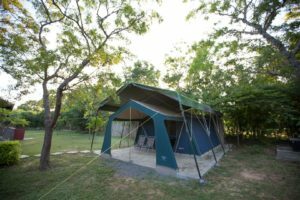 For the more adventurous type who want to feel even closer to nature we also offer a luxury tent with an attached toilet for two to four more guests which is within the one acre garden.